You will be blown away on this a 7 Days Uganda Tour, you are taken through Uganda’s top tourist hotspots. This safari combines gorilla tracking, chimpanzee tracking and game drives in the vast savannah of Queen Elizabeth National Park and Lake Mburo National Park..
4×4 Safari Landcruiser / Minivan (up to eight passengers) with pop-up tops and seven window seats for game viewing. Groups of twelve or more people who would like to travel in one vehicle are offered 25-28 seat coasters that have about 16 window seats. Our Safari vehicles are well maintained to provide the maximum level of comfort and safety. Starting from: USD $4,675 (Budget Accommodation) | USD $ 5175(Mid-range Accommodation) | USD $5875 (Luxury Accommodation) per person based on two travelers sharing. Sky hotel in Kampala located 10 Km from the city center towards Naalya Housing Estate, it has a capacity of 29 Rooms with twin beds taking up 58 guests, there is one restaurant, which is open from 7-10 am for breakfast. However, it is open for the rest of the day for meals. Simba Safari Camp, renowned for excellent hospitality, is nestled atop a hill overlooking Lake Kikorongo on the edge of Uganda’s most popular Queen Elizabeth National Park (QE), with panoramic views across the park’s extensive savannah plains teeming with wildlife as well as Lakes George and the famed Kazinga Channel. It is the closest accommodation to QE’s Kasenyi plains on the edge of Lake George, the famed mating grounds for the Uganda Kobs and thus the most preferred area for game viewing drives. It is also closest to the other areas of northern Queen Elizabeth National Park, including the Mweya Peninsula and the Kazinga Channel; well known for launch cruises, close range game-viewing as well as bird-viewing. There is also an opportunity to go for guided chimpanzees tracking in Kyambura Gorge. Buhoma lodge, situated within the Bwindi National Park, less than five-minutes-walk from the gorilla trekking start point. An elevated lounge area, complete with bar and dining facilities, offers a cosy, comfortable environment in which to discuss the day’s activities around the fireplace. Buhoma lodge has Eight, comfortable cottages each with its own private veranda, offering extensive views of the forest canopy of the National Park. Inside the spacious cottages have comfortable beds, a well-appointed en-suite bathroom with flushing toilet and a hot shower, some rooms have bathtubs. LodgeAn elevated lounge area, complete with bar and dining facilities, offers a cosy, comfortable environment in which to discuss the day’s activities around the fireplace. Lion Tracking in Queen Elizabeth Park, this can be done on day 3. For visitors who yearn to get up close to wild African fauna, a research trip is a rewarding adventure. This new and unique experience allows visitors to actively participate in monitoring some of the lions in the park, using locator devices and learn habituation calls, as well as monitoring weather, surroundings, and behavior. The results are added to researchers’ databases, contributing valuable information to the overall understanding of wildlife ecology – and helping to conserve this wonderful ecosystem. This will as well give you a 95% chance to see the lions! Chimp tracking in Kyambura Gorge/ Queen Elizabeth Park, this can be done on day 3. Mountain Bike Safari in Lake Mburo National Park, this can be done on day 4. Depending on your arrival time, relax in your already-booked hotel after a long flight while you are dreaming of your safari tomorrow morning at 8:00 am from your Kampala location by your guide. Make your journey through the papyrus swamps and thick jungle of the Nile delta and arrive at Kibale national park. Head out for an afternoon guided walk in the Crater Lake areas of the park. Dinner and overnight at Primate Lodge. Primate Lodge Kibale’s principal edge is our location, tucked deep in the forest and right next door to the starting point for Chimpanzee tracking excursion as well as the incredible Chimpanzee Habituation, really, two of the most genuinely breath-taking wildlife experiences on the planet. Embark on an exciting early morning trek for chimpanzees in the thick jungle of Kibale forest. Then drive southwards to Queen Elizabeth national park in the afternoon, sightseeing and game viewing enroute. Depart at 6:00am for a morning game drive in Queen Elizabeth national park aiming to catch the lions hunting in the morning. Lions usually hunt as the day dawns since the temperatures are cooler. We also expect to see the Uganda kob, elephants, buffalo, warthog, leopard, and waterbuck. After the game drive, have lunch then enjoy a boat cruise on the Kazinga channel which connects Lake Edward and Lake George. Expect to see large numbers of buffalo and hippo. After the boat cruise, we drive southwards to Lake Mburo National park. Dinner and overnight at Mihingo Lodge. Mihingo is a luxurious, family-owned lodge in a magical setting adjacent to Lake Mburo National Park. To further enhance your experience of wild Africa, Mihingo is the only lodge in Uganda to offer daytime and overnight horse safaris into the national park. We begin the day with breakfast then go for a game drive in the park. Lake Mburo National park is home to several savannah wildlife such as the gigantic eland, topi, warthog, impala, zebras, leopards and several savannah bird species some of which include lapwings, hornbills, and cocqui francolin. The park boasts of a beautiful acacia savannah terrain and woodlands. Dinner and overnight at Mihingo Lodge. Begin the day with breakfast, and then embark on a drive to Kyambura Gorge for a primate walk expecting to see chimpanzees, vervet monkey, olive baboon, and black & white Columbus monkey. Continue south on a game drive to Ishasha and proceed to Bwindi Impenetrable forest. Ishasha is most famous for its tree-climbing lions. Dinner and overnight at Buhoma lodge. 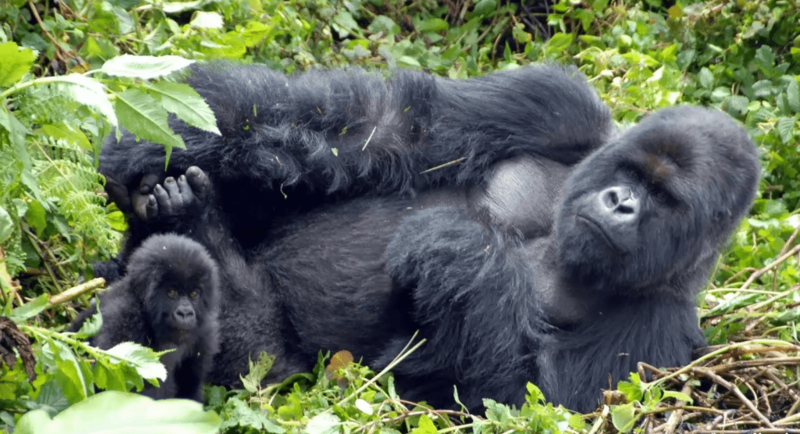 It is situated within the Bwindi National Park, less than five minutes-walk from the gorilla trekking start point. An elevated lounge area, complete with bar and dining facilities, offers a cosy, comfortable environment in which to discuss the day’s activities around the fireplace. Buhoma lodge has Eight, comfortable cottages each with its own private veranda, offering extensive views of the forest canopy of the National Park. Inside the spacious cottages have comfortable beds, a well-appointed en suite bathroom with flushing toilet and a hot shower, some rooms have bathtubs. An elevated lounge area, complete with bar and dining facilities, offers a cosy, comfortable environment in which to discuss the day’s activities around the fireplace. After breakfast, prepare for the gorilla tracking adventure which begins at 8:00am with a briefing at the information center by the Uganda Wildlife Authority staff. We will then be guided into the jungle to track the shy primates. Gorilla tracking may take 3 to 7 hours but it is well worth the effort. It’s advisable to bring along a rain jacket, and hiking boots. At the end of this long and exciting adventure, return to our lodge for a well-deserved shower, dinner and rest. Dinner and overnight at Buhoma Lodge. After breakfast transfer back to Kampala making a lunch stop enroute at Mbarara. Proceed making another stop at the equator in Masaka; see where this imaginary line divides our planet into two equal hemispheres. Snacks, souvenirs and photographs may be taken here. Arrive in Kampala later that evening and transferred to Entebbe for your departure flight. In the evening, go for a community walk where you will visit the Batwa, which is an indigenous group of people that has lived in the forest for many years, enjoy traditional dances from them. Head back to the lodge for Dinner and overnight at Buhoma lodge.